I love everything about this look, except for the hat and gigantor handbag. The colors are arresting, the proportions are flattering and also wearable, and those SHOES. Oh, those shoes. The belt also gets a special call out for being a great punctuation point. Here I go searching for Obi belts and everything else. The skirt was easy. Eshakti.com custom makes clothing to your very own measurements. This box pleated chambray skirt is the perfect weight and length (though you can modify it if you’d like). The blouse was tough. The Burberry top is very distinctive, and any sort of “tribal” or “Aztec” print that tries to emulate it is bound to look cheesy. Instead, go with the general shape (jewel neck and blousy), and accessorize with a geometric bib necklace to get the same effect. Obi and other waist-defining wide belts are a great way to create a curve if you’re straight, or highlight curves if you’ve got them. The shoes were another definite compromise. 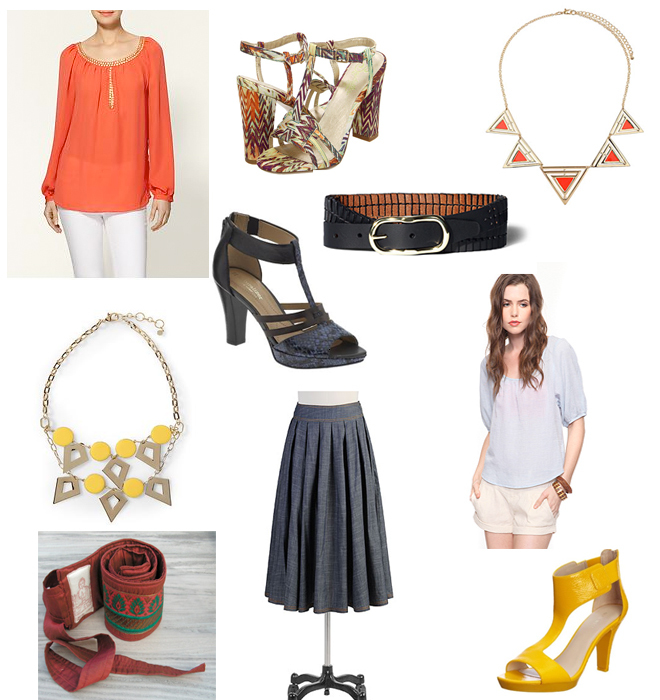 But again, I went with the shape (t-strap) and color (coordinating with the blouse and necklace) to get the same vibe. nice alternate choices. i really appreciate that you explain your process. i’d ditch the hat and bag too.